Our first and most coveted collection is back for a rematch! Rock Paper Scissors Round 2 was inspired by a vintage signet style pinky ring that was given to our father by his father before he passed away. Years ago, our family's home was broken into and this is one of the only piece of jewelry from our grandfather we have left to remember him by. Each piece in the collection is designed to resemble a signet ring and is named for the round, baguette, and princess cut diamonds throughout each design. Styles like the Paper Covers Rock Neck Chain and the Rock Smashes Scissors Hoops all reflect the vintage signet style we know and love. The Hopscotch collection was named for the geometric square elements throughout each design and features princess cut diamonds or emeralds. Our original inspiration for this collection stems from our late grandfathers ring. He and our grandmother had a matching set that they bought together on their travels. Although our grandfather passed when we were very young, we have always been inspired by his style and eye for the arts and are still influenced by him everyday. Each piece in the Hopscotch collection is beautifully simple and elegantly refined. Although their are sharp angles in the designs, we developed each piece with great care so they are incredibly comfortable for everyday wear. "I love that the design is a bit non-traditional but it’s still simple enough to wear without overpowering things." Originally inspired by a family heirloom passed down from our grandmother, the Connect The Dots collection was named for the golden spheres and cylinders sprinkled with dainty diamonds or rainbow sapphires throughout each design. The heirloom our grandmother gave to us before she passed was a golden pendant scattered with diamonds of all sizes. She wore this as often as we can remember and it will always have a special spot in our hearts. Each piece in the Connect The Dots collection is sprinkled with ethically sourced, round brilliant cut diamonds set in fair trade, recycled 14k gold. The collection also features our first ever seamless hoop design! 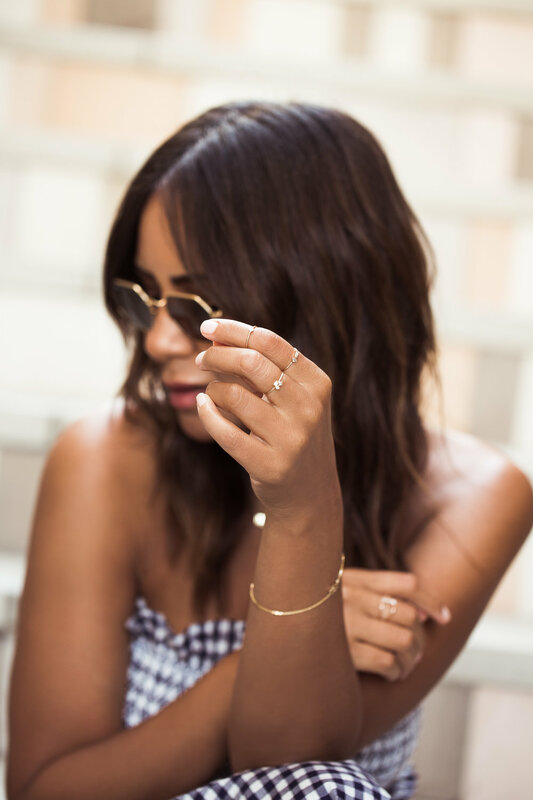 Fashion influencer, Taye Hansberry spends a Summer day and evening at her hometown's chicest street, Melrose Place, in her favorite Lane + Lanae pieces. The Los Angeles native has a knack for a perfect ear stack and styled our pieces alongside some of her expertly placed piercings. We've known Taye for years and she is as beautiful on the inside as she is on the outside!